some codes and prices need to stay hidden because they are too low to be public. please be adviced that not every deal or groupbuy give you the best deal! look for shipping / insurance costs also - they sometimes are different from country to country! post your request in the thread, send me a PM or just click request a code in the Blogs menue! i will negotiate with the shops to get the best possible discount for you. if you use that afflink i get a reward from the shop - no pricechanges for you. PM me if you have questions about that. if a deal is a deal can be decided only by you - depending on where you live and which delivery service you prefer the endprice can be different to other shops. Code is active Nov 1-11 2018 – hope you catch some nice items! you klick the link to the productpage and enter the code to get the better price at checkout! if one uses my "affiliate-link" the discount is the same - the only difference is that banggood rewards me for the order you made. M4D M4X , I can see you have thought about this and are trying to be respnsive. First it may make sense to some how explaine that even though the price is the same for us via the first link or the second you receive a small finders fee if we use the second, (hey it costs us nothing and you can pay your internet bill (maybe ). Second maybe I dont get it but if you cant post the prices here either (same MAP constraint) then how is this thread different from the “Banggood” thread? What I know is the the Banggood user name here has been totally un responsive to my 2 notes but you have always been present and for that I am appreciative. Oh lets have Banggood acknolwedge that “headlamps” are a also part of the general BLF code. “Bike” lights “should” also apply but maybe they have an issue with that. If so let take the headlamp inclusion and call it a win. Waiting to hear back from your negotiating success. I’ve bought a lot of stuff at BG over the years. Will they give me a code I can use from now on? I suppose I should ask them, but I’d rather ask ‘in public’ here. 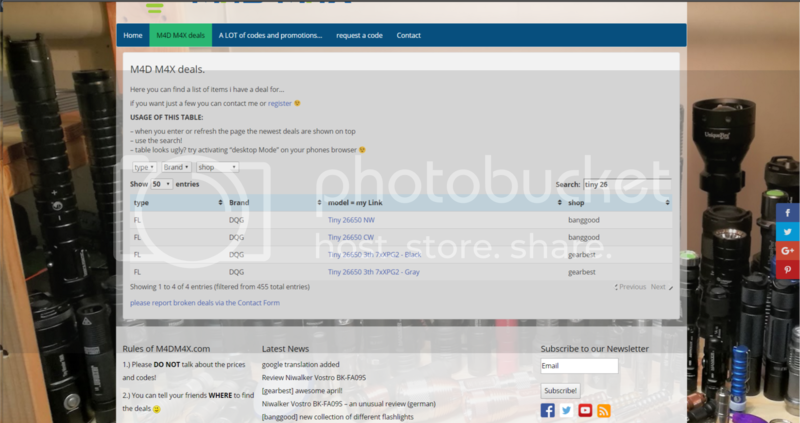 you can ask the user banggood here in the forum or mail the shop. if you tell them that you ordered a lot i am sure you get a good deal! You missed off OLIGHT SR52 !! Oh yes, did I miss it? Or did you edit! Do you ever get deals for Zebralight or Armytek? M4D M4X ,I appreciate you getting codes you have saved me about $50 this month. (which I guess means I buy to much) I look at it as BG paying you a sales commission, cause most likely I would have bought from another site or not got them at all. If members don’t like what you do I don’t know why the bother reading your posts. I would love a discount code for the TI DQG Spy and the Sunwayman F40a. A few of us got our Tiaras with a M4D M4X code. You got what? Do you wear it with a Tutu? I know what they are... I did a give away of one that Illumn provided free of charge. I always thought the name was a terrible choice. Hi, any response from BG regarding the CH10? Code for a Olight ST25 Baton? Can you find out which of the three available tints this one is? Thanks much for the code!!! and used code FDDNCR but it did not work. mhanlen sent me one that was “bricked” I was able get it running (again thank you). Here is what I think, I love the fact that in two clicks I can get the full range from maybe 10-30 lumes up to the rated 450 (which for a head lamp is a lot). No observed PWM no humming. It is light weight, the band is a bit snug for “Einstein heads”, think of it as “secure “ Maybe when the elsatic streches a bit it will be just right. FYI for thoes of us who like to mod. The head is pressfit over the (glass,reflector,emitter and pill) in such a way that I have not figured out how to get into it . The head unscrews easily and access to both sides the board and teeny tiny wires is right there, the switch wires are tucked up in a hard to access recess (havent figured out how to get the switch out). So on a moding scale this on is a mechanical challange. The battery comparment is long, if you pull the plain spring out it measures 75.5mm so if one wanted I am sure two 18350 cells would fit with rooom to spare, add a small spring and bobs your uncle. (just in case you were thinking about a 6V mod ). Now if only we could get to the emitter. I get that you were being sensitive to some criticism (deserved or not) about links. But consider that if you don’t post (your) link in (your) thread it means that we and you need to go through additional separate PM’s to get your link. If you are going to post the price with the code put your link up and we will be done with it. I thought you were going to post two links and we would pick one (I say just post your link) and if we want to use the code directly, then folks will take care of that them selves. So a long version of “thanks you”, yes please send me a link to the ch10 or better yet just post it in this thread.